Get out the stockings and hang them up on the fireplace. 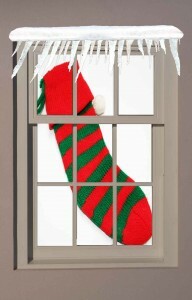 As it is only 10 days until Christmas get out the stockings ready for Santa’s visit. Remember the bigger the more you get in there!! I was intrigued by where hanging a stocking on the fireplace originated, so did a little research, coming back with two theories from which this Christmas tradition came from. The first place it could of started is La Befana in Italy, an old lady who rides a broomstick comes down the chimney to give good children presents in their socks and bad children coal, all on Epiphany Eve (January 5th). La Befana is portrayed as an old lady who before the birth of baby Jesus put up the three wise men on their journey to find Jesus. They invited her to join their travels, but she declined saying she was too busy, but later had a change of heart leaving her to try and find the baby Jesus. Whilst she was searching for Jesus she would leave presents for good children she passed along the way, sometimes sweeping the halls on the way out. Legend has it she is still hunting the son of God today, still delivering gifts to good children along the way. The second theory is it originated here in England, with good ol’ St Nicholas who is believed to have left gold in the stockings of three poor maidens who needed money for their wedding drowries. They had hung them on the fireplace to dry and when they awoke, they found bags of gold in their stockings! Since then children have hung stockings on the fireplace in an attempt to receive the same good fortune. I wish I woke up to a bag of gold in my stockings (at least my socks)! I bet you are all excited for todays joke from John! Anglian Home Improvements raising the standards since 1966. For information on our home improvement products visit our website.